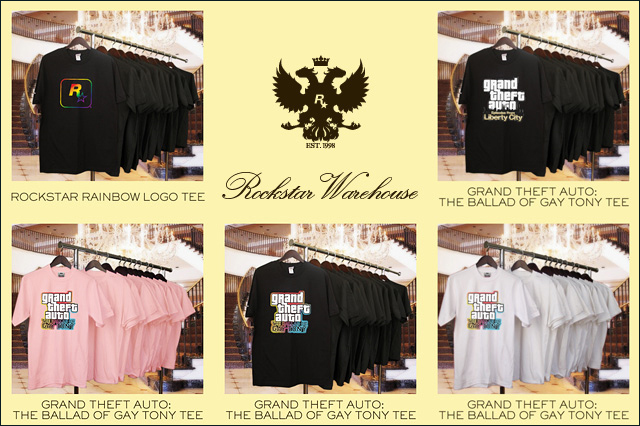 The Rockstar Warehouse proudly presents 3 brand new limited edition Ballad of Gay Tony t-shirts! These shirts will be cotton and available in sizes Small though XXL. The Rockstar Rainbow Logo shirt is available in black and is produced via a special 8 silkscreen process. The Grand Theft Auto: The Ballad of Gay Tony Logo shirt is available in your choice of pink, white, or black. Show off your DLC excitement with one of these! The Grand Theft Auto: Episodes from Liberty City Logo shirt is available in black and features the very cool Liberty City skyline logo in reflective gold foil. These shirts are going fast, pick one up today! hahaha, I'm sure the game rules but who is gonna wear "GAY TONY" all huge on their self? Personally I like the Episodes from Liberty City Logo one. They need to put the rainbow logo on a poster.